The Giant, Standard, and Miniature are three DIFFERENT BREEDS OF SCHNAUZERS. Although the three breeds of Schnauzers are all sized differently... size alone is not what makes them classified as a Miniature, Standard or Giant. Size is just a part of what makes them different and not fully related. They have totally different breeds in them (aside from one breed in common, a Standard Schnauzer), all three have different histories, etc. A "Toy" or "Teacup" however are actually just an undersized Miniature and not a separate breed/bloodline from the Miniature Schnauzer. As a Schnauzer lover it is important to understand the history and that each of the three Schnauzer breeds are a distinct and separate classification. Let's start with height as conformation as an example (visible details of a dog's structure and appearance). The ORIGINAL Schnauzer is the Standard Schnauzer, the ideal height is 18½ to 19½ inches for males and 17½ inches to 18½ inches for females. 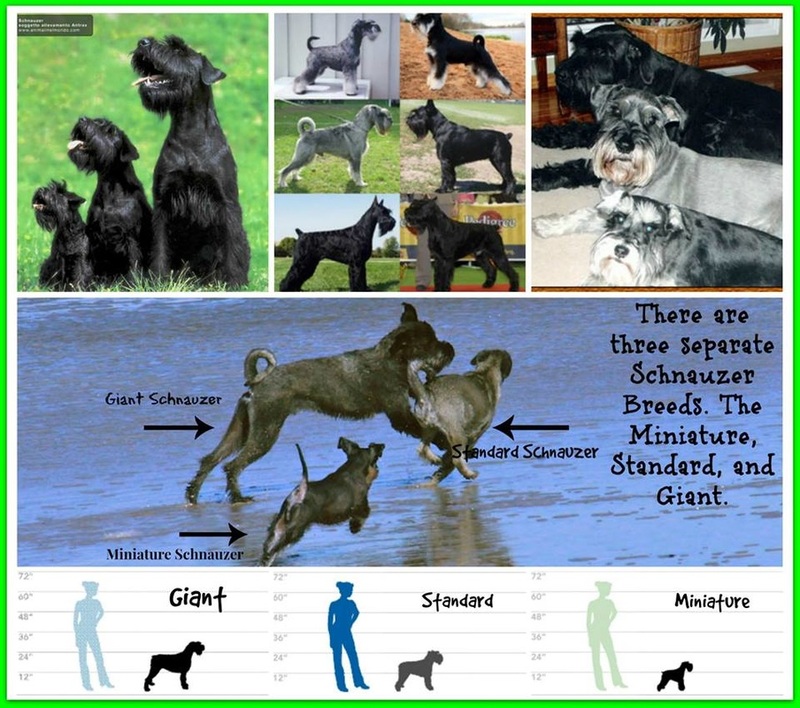 Breeders created the Miniature Schnauzer and the Giant Schnauzer by adding other breeds to the gene pool to create a smaller and larger version of the Standard Schnauzer. Since other breeds were added to create the difference, it made them genetically different from each other AND SEPARATE SCHNAUZER BREEDS. Each Schnauzer breed has similar characteristics and then its own characteristics as a result of the gene pool involved to create each breed--they are considered COUSINS. Therefore just because a Miniature Schnauzer ends up 30 pounds and 16 inches tall does NOT make it a Standard Schnauzer even though conformation requires 12 to 14 inches for the ideal Miniature. The standard height, is the height that SHOW breeders use for conformation. If a Miniature is taller or shorter than the standard height for conformation it simply makes the dog outside of the standard conformation for that breed and not "show material". When you read the AKC breed description it gives you what the goal for the breed is (as in visible appearance) and even show breeders have dogs that end up either too tall or too short for the breed standard appearance and they go to pet homes. Each Schnauzer Club link below covers the different breeds and history.